Robert L. 'Lee' Archer, M.D., has been named chair of the Department of Neurology in the College of Medicine at UAMS. Archer, who has led the department on an interim basis since July 2016, has served on the UAMS faculty for more than 30 years. July 27, 2017 | July 27, 2017 | Robert L. “Lee” Archer, M.D., has been named chair of the Department of Neurology in the College of Medicine at the University of Arkansas for Medical Sciences (UAMS), effective Aug. 1. 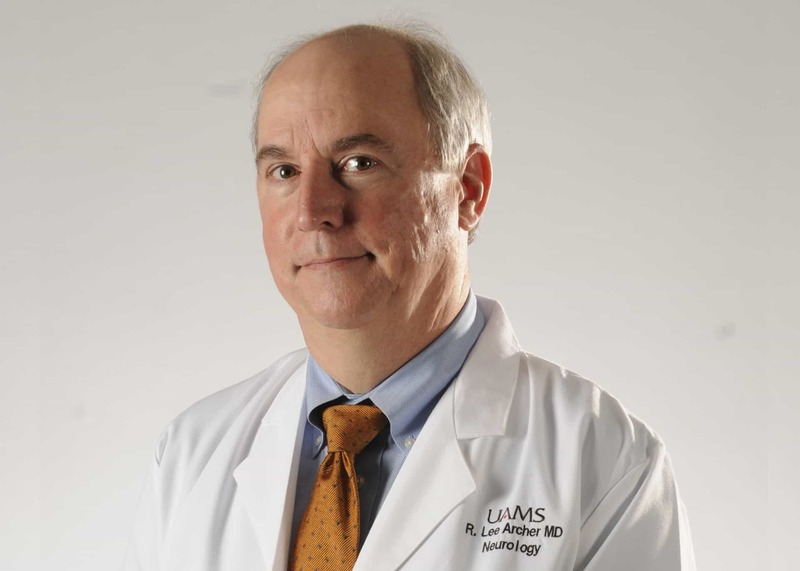 Archer, who has led the department on an interim basis since July 2016, has served on the UAMS faculty for more than 30 years, providing world-class care for Arkansans with multiple sclerosis (MS), while teaching and mentoring many future neurologists. He has earned the admiration of his patients, students, residents and colleagues. ‘Any leader wants to bring out the strengths in the group,’ Archer said of his approach to chairing the Department of Neurology, pictured here. Two of those new faculty members were recruited to improve stroke and critical care services, one of Archer’s key areas of focus. 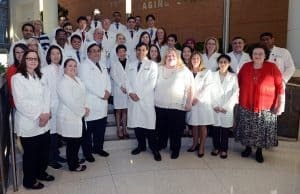 Other goals include facilitating the efforts of the Movement Disorders Clinic, including collaborative work with the College of Medicine’s Department of Geriatrics and the UAMS Donald W. Reynolds Institute on Aging specifically in Alzheimer’s disease, and building on the already strong Multiple Sclerosis Clinic by supporting faculty research. Archer also will focus on strengthening ties with the basic science faculty at UAMS, particularly in bioinformatics, to fully take advantage of research, education and collaboration opportunities. He will advance the department’s research into amyotrophic lateral sclerosis (ALS) by filling two endowed chair positions in association with the Department of Pharmacology and Toxicology. He will continue to work closely with the UAMS Department of Neurosurgery to ensure patients receive seamless care from diagnosis to surgery to follow-up care. “I think any leader wants to bring out the strengths in the group, so I want to facilitate the careers of the talented people we have here and bring in more talented people to expand on our strengths,” Archer said. Archer, who is highly regarded in the MS patient community, will continue to spend about half of his time on patient care. He has trained and hired a second physician, Carolyn Mehaffey, M.D., to continue to serve MS patients in Arkansas and allow the UAMS MS clinic to accept new patients. Archer received his medical degree from the College of Medicine in 1982. He completed his residency at UAMS, joined the faculty in 1986 and has held the rank of professor since 2008. He founded UAMS’ Multiple Sclerosis Service in 1987 and co-directed the Muscular Dystrophy Association Clinic at UAMS from 1989 to 2003. This month Archer will conclude 13 years of service as chair of the University Hospital Medical Ethics Advisory Committee. He has served on many other institutional panels, including the College of Medicine Promotion and Tenure Committee, which he chaired in 2016-2017. Archer is president-elect of the Arkansas Medical Society. He is also active in the National Multiple Sclerosis Society and several civic organizations. He has served on the Board of Directors for the Arkansas Regional Organ Recovery Association (ARORA) since 2005 and chaired the organization in 2014-2016. Among many honors, Archer was invested in 2007 as the inaugural holder of the Major and Ruth Nodini Chair in Neurology, which was established with $1 million in donations to support his clinical care, research into MS and educational programs. One initiative partially funded by the endowment is the MS Fellowship developed and led by Archer, which graduated its first fellow — new faculty member Mehaffey — this past June. Archer has been married to his wife, Nancy, for 40 years.